I’m sorry to report there has been no further progress on the chair cushion dilemma. The fabric is still pinned to the cushion. I do thank all of the readers who have told me how they would fix the mess I’ve made. I really appreciate your help! I’ll be sure to let you know once anything more happens on the cushion front. 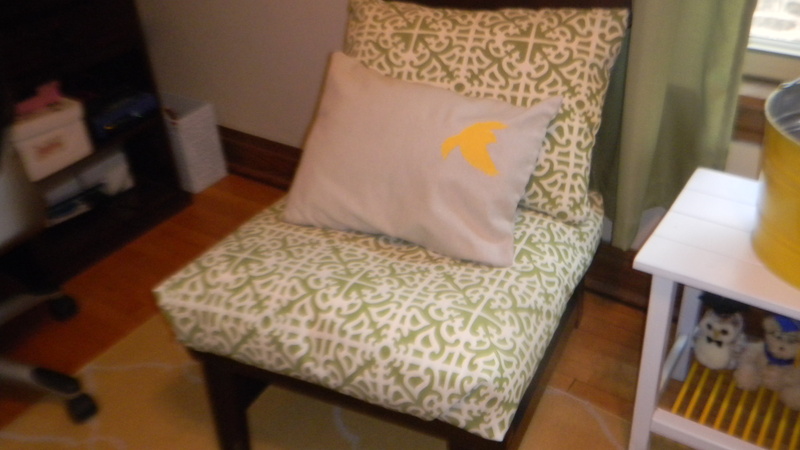 However, I did dress up the chair with another throw pillow I just made. Check it out. Such a happy and bright bird on a neutral background. I shall name him Stanley. He looks like a Stanley. I’ve already showed you how to (sort of) make a simple rectangular pillow, so I won’t go through that tutorial again. 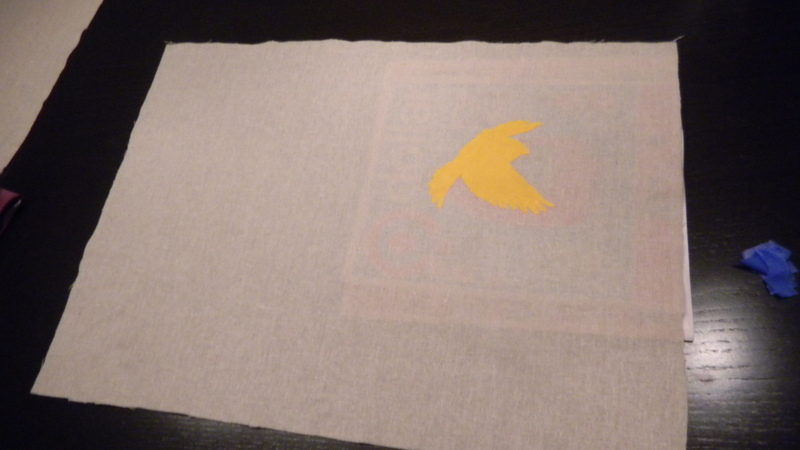 Instead, I’ll show you how I stenciled Stanley onto the fabric. I was a little nervous, since I hadn’t ever stenciled onto fabric before. I had nightmares the paint would run or soak through and then I’d have to start all over. 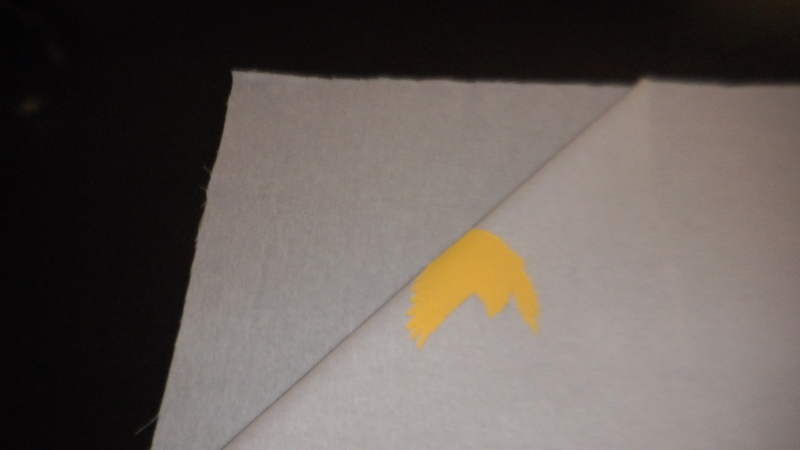 I even considered buying some yellow felt or a fabric remnant in a cool pattern, cutting our bird shapes, and sewing them onto the pillow in order to avoid painting onto the fabric itself. But, I sucked it up and decided to go for it. I started with a yard of utility fabric from JoAnn Fabrics. Super cheap and super durable. I threw it in the washer and dryer so it could shrink if it was going to, and to make sure the fabric was clean and ready for painting. I ironed it too to get rid of any wrinkles. Make sure not to use fabric softener. Not sure why, but the fabric paint I used and all fabric painting websites I looked at told me not to do it. So, I didn’t. I searched for a pillow insert for a while. Holy goodness those things are expensive! No way I’m paying $27.99 for only an insert. I wouldn’t even pay that for a pillow. I’m too cheap. Dan came up with a great idea while we were at Wal-Mart in search of a reasonably priced insert. I had wanted it to be a small throw pillow, so why not use a travel pillow as my insert? Works for me and it was only $3.99! When I got home, I measured the pillow and cut the fabric. It was decision time. I had to decide what I wanted the stencil to look like. 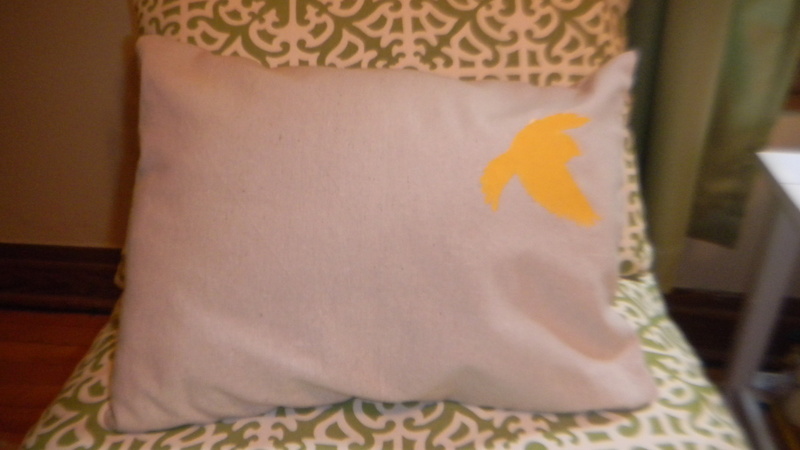 Originally, I wanted a birds on a wire pillow, but then I thought just one solitary flying bird might be nice. I hemmed and hawed (because I hem and haw over everything) and eventually decided to go with the one bird look. It was a bonus to me that I didn’t need to create my own stencil, or find a new one. When had I ordered the birch forest from Cutting Edge Stencils to make some wall art, a little bird stencil came with my order. It must have been fate. I started playing around with the stencil to see where I thought it would look best. Hmm…how would it look with a whole flock of birds? I ended up positioning it in the top right corner of the fabric, so he looked like he was flying off the pillow. I put some newspaper underneath the fabric to stop any kind of bleed through, and taped the stencil to the fabric using painter’s tape. 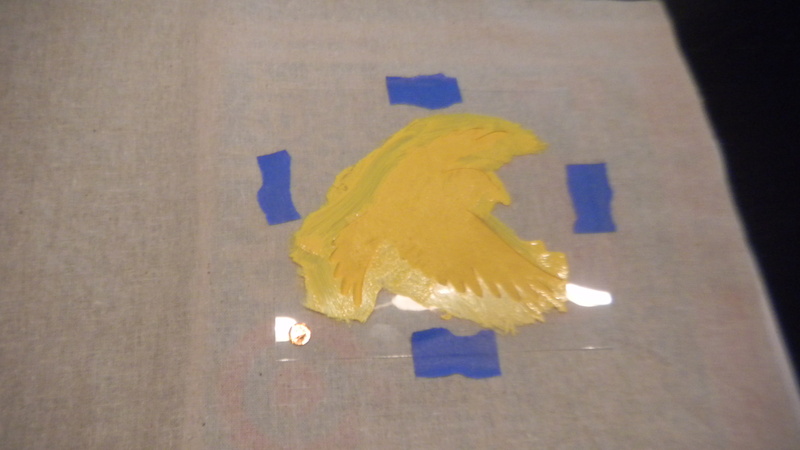 I poured some yellow fabric paint into a disposable plastic glass, got my brush wet and started dabbing away. It bled a little outside the stencil, but wasn’t too noticeable. In retrospect, I probably should have traced the bird with a pencil, then used a fine brush to paint it in. Oh well. Next time. When the bird was dry, I gave it another coat to make the color brighter. Once the second coat was dry, I lined up my fabric to begin hand sewing the pillow. I know, I should use a sewing machine. I don’t have one handy at the moment. Be sure to put the stenciled part inward when you sew since you turn the pillow inside out during one of the later steps in making the pillow. I stitched three sides, put the insert into the case, then tried to sew that final side with an invisible stitch. Still not the best, but I am definitely getting better. The final few inches I sewed look pretty good. Maybe I’ll go back a re-sew it someday. Here’s Stanley just chilling in his new spot. He turned out a bit more yellow than the rug, which wasn’t my intention, but it was a welcome surprise. Stanley’s brightness keeps the yellows from looking too matchy-matchy, and I love the softer color, but more industrial feel that the utility fabric brings to the room. I think the office re-do is nearing its end! What’s left? other cheap pillow option (if you’re not too grossed out by it) is to hit up good will and cover those. my mom helped me do that for lil throw pillows for our office. and you will appreciate this: i recycled the duvet cover i had from lansing (that bit it on the highway… that’s another story) covering the pillows, as well as covering bases for 2 chairs matt had curtain tie backs (the curtains too were recycled from my lansing apartment). i can’t take credit for anything on that project other then supervising!